C-FEBX gets attention at Vancouver. C-FEBX a Vazar turbine conversion. C-FEBX at Campbell River - CYBL, British Columbia. C-FEBX back at Vancouver - CYVR. C-FEBX at Campbell River just sixteen days before accident. • 3680 Royal Canadian Air Force. Delivered 18-May-1954. Its first and indeed only military assignment was to 121 Communications & Rescue Flight at the Sea Island Air Station, Vancouver, BC. until October 1962. Placed into storage as reserve aircraft at the Canadian Pacific depot at Lincoln Park, Calgary, AB. It remained there until 12th March 1964 when it was ferried to Saskatoon and put into storage there pending disposal. • CF-MPK Royal Canadian Mounted Police Air Division, Ottawa, ON. Based at Whitehorse, YT. Regd 1964. • CF-EBX EB Exploration of Ottawa. Circa 1972. • CF-EBX Royal Canadian Mounted Police Air Division, Ottawa, ON. Initially based Thompson, MB. Circa 1974 Later Goose Bay, NL., circa 1978. Incident: Goose Bay NL 25th May 1981, The Otter had four passengers and their baggage on board and was 500 pounds below maximum take-off weight. After holding for a Boeing 737 and a DC-3 to depart, the pilot started his take-off run. Shortly after lift-off, he reduced to climb power and started a right turn. The airspeed began to decrease so he lowered the nose and applied full power but the Otter continued to settle. The pilot attempted to turn back to a cleared area beside the runway but the aircraft struck trees, touched down, then bounced once before coming to rest. Investigation revealed no airframe or engine deficiency and concluded that the turn was initiated prematurely, resulting in a stall at too low an altitude for recovery. The pilot stated that he turned early to avoid wake turbulence, although he did not feel that wake turbulence was a factor in the accident. The main area of damage was around the tailwheel and after a delay of a few months sourcing parts, the aircraft was flying again in November 1981. Accident: Mary's Harbour, NL. 11-Apr-1985. The pilot was attempting a take-off in a ten knot 60 degree left crosswind. As the tail lifted off the ground, the Otter veered sharply to the left. The pilot applied brake and opposite rudder to regain directional control but was unsuccessful. He then closed the throttle in an attempt to prevent the aircraft from leaving the runway. However, the Otter rode up into a snowbank at the edge of the runway, damaging the right wing and stabiliser. The damage was repaired. Note: Removed from service in Sep-1985 and handed over to the Crown Assets Disposal Corporation for sale. Total time: 13,498hrs at Sep-1985. • C-FEBX Vincent Courville, Montreal, QC. Regd circa Sep-1985. Canx 29-May-1986. • C-FEBX McMurray Flight Centre Ltd., dba Brown's Air Service Fort McMurray, AB. Canx 18-Jun-1986. • C-FEBX Queen Charlotte Helicopters Ltd., Sandspit, Queen Charlotte Islands, BC. (Also shown as Nanaimo, BC., on CCAR). Canx 13-Jan-1988. • C-FEBX I. & J. Logging, Campbell River, BC. Regd 13-Jan-1988. Canx 24-Feb-1988. • C-FEBX Harbour Air, Richmond, BC. Regd 24-Feb-1988. Canx 24-Feb-1988. • C-FEBX Gynn Bay Logging Ltd., dba Western Straits Air, Campbell River, BC. Regd 15-Jun-1989. Note: Converted to turbine power with a Vazar PT-6 engine by Aeroflite at Vancouver Airport. Accident: Head of Knight Inlet, BC. 28-Oct-1993. On the landing roll, the left main gear on the amphibious floats collapsed and the aircraft skidded off the runway. The left float was damaged but there were no injuries. A securing bolt in the left main gear had failed. The damage was repaired and the aircraft returned to service. Accident: Six miles north-west of Campbell River, BC. 27-Sep-1995. The aircraft took off from Triumph Bay at 16:34 hours Pacific Daylight Time with one pilot and nine passengers on board for its VFR flight to the Campbell River Airport. At 19:01 hours the pilot called Campbell River FSS and reported that he was seven nautical miles northwest of the airport inbound for a landing. The pilot was given the Campbell River weather observation for 19:00 hours, which was ceiling 300 feet overcast and visibility two miles in light rain and fog. He requested a special VFR clearance to enter the control zone, which was granted at 1904. Radar data indicated that, at that time, the aircraft was about one mile northwest of Tyee Spit, a frequently used alternate site (water) for company aircraft when weather conditions precluded a landing at the Campbell River airport. After passing Tyee Spit, the Otter turned southbound and flew directly toward the airport. At about two and a half miles from the airport, the aircraft turned right to a heading of approximately 310 magnetic and flew in that general direction for about two minutes. The aircraft was on a track that was approximately parallel to the extended runway centre-line, tracking outbound from the airport, with the localizer and the Campbell River NDB to the left. The Otter passed abeam the NDB, which serves as the final approach fix for the ILS approach to runway 11 and continued outbound. At 19:09 hours, at about three miles outside the beacon, the Otter turned left to a southerly heading towards the NDB and at 19:10:08 the pilot radioed that he was seven miles northwest, this being the last transmission from the flight. At 19:10:25 radar contact was lost when the Otter crashed in heavy fog into the densely wooded side of a 1,047 foot hill at about the 860 foot level, in straight and level flight. The pilot and seven passengers were killed in the crash and the two remaining passengers received serious injuries. Total time: 16,428 hrs at Oct-1993. • C-FEBX Canx 31-Jul-1996 and removed from register. Otter 38 was delivered to the RCAF on 18th May 1954 with serial 3680. Its first and indeed only military assignment was to 121 Communications & Rescue Flight at the Sea Island Air Station, Vancouver, BC where it adopted the Flight's QT code. It and 3682 were delivered to the Flight to replace 3670 and 3676 which had been destroyed in a hangar fire at Sea Island on 29th April 1954. 3680 was to serve the Flight for nearly eight and half years, until October 1962 and to be involved in many rescues along the Pacific coast. When it joined the Flight, 121 also operated two Beech Expeditors, nine Cansos and four Dakotas. On 3rd June 1955 3680 was involved in the search for Luscombe CF-GJC which crashed en route from Princeton, BC to Vancouver. After the wreckage was found near Hope, BC a US Coast Guard S-55 helicopter from Port Angeles flew in to recover the bodies of those killed in the crash and the Otter surveyed the scene. During August '55 3680 and several of the Unit's other aircraft were engaged in a large-scale search for Pacific Western Airlines Grumman Mallard CF-IOA, with five souls on board, which disappeared on 3rd August '55 en route from Kemano to Kittimat in northern BC. Other aircraft involved were one Dakota, one Expeditor and four Cansos from 121 C&R and two Royal Canadian Navy Grumman Avengers. Otter 3680 operated initially from Kittimat for the search, later flying from Smithers, searching the Seven Sisters Mountains and the Skeena River. The Unit's Otter 3682 also joined the search, which lasted until 24th August '55. On 24th November 1955 3680 took part in the rescue of one of the Unit's own aircraft, when Canso 11073 force landed in Kelsey Bay near Helmchen Island. Throughout its service with 121 C&R there were also countless medevacs to perform, up and down the BC coast and inland, also rescues and searches for boats in distress along the coast and inland searches for missing hunters, tourists etc. It was a busy tasking. On 16th January 1957 3680 was damaged at Squamish, BC when high winds blew the Otter against a dock, causing damage to the floats. On 2nd September '58 the BC Forest Service requested the evacuation of an injured firefighter from Revelstoke. 3680 escorted a US Coast Guard S-55 from Port Angeles, but the helicopter was unable to lift off the patient from the 5,300 foot level. RCAF H-21 serial 9611 completed the rescue. On 3rd January 1959 Taylorcraft CF-HEO flew a doctor from Bella Coola to Lonesome Lake to attend an expectant mother, but became overdue on its return. Dakota 692 en route to Prince George was diverted to Lonesome Lake but could not see anything. Otter 3680, then operating on skis, was dispatched to the lake, found the Taylorcraft to be unserviceable and flew the expectant mother to hospital at Williams Lake. On 17th July '59 3680 (and 121's other Otter 3682) flew out from Sea Island to investigate a report from a Pacific Northern flight that there was a fire on the water between Dungeness and Victoria. This turned out to be a smoke bomb dropped by a US Navy Neptune. On 19th July '61 two mountain climbers were caught in an avalanche on Garibaldi Mountain. Otter 3680 and Canso 11089 provided fuel support for 121's Vertol H-21 9614 which flew in to make the rescue. On 19th January 1962 3680 went to the assistance of Luscombe CF-MLI, which had force landed on Pennask Lake near Kelowna. The Otter, on wheel-skis, departed Sea Island and after refuelling at Princeton landed on Pennask Lake. 121 C&R's Albatross 9305 provided top cover and reported that the Otter was having trouble manoeuvring on the lake due to heavy snow with an underlay of slush. The Otter pilot advised he was unable to take off and would have to remain on the lake overnight and tramp out a path in the morning. Sleeping bags and supplies were dropped by the Albatross. Both the Otter and the Luscombe were flown off the lake the next day. In February 1962 the Otter flew across the country to Downsview, where it was repainted by DHC. The paint shop records show that the aircraft was stripped and re-painted in the latest RCAF markings, including white top, ensign on the fin, 'Rescue' markings in day-glo and the wingtips and tail painted fire red day-glo. 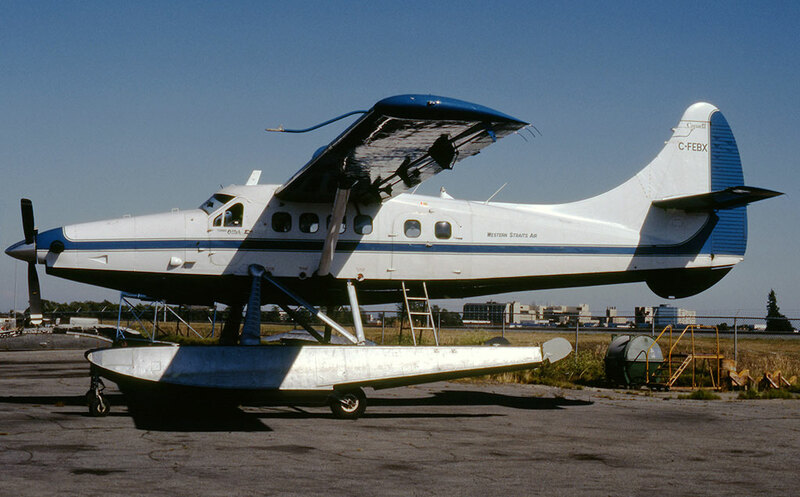 The Otter then returned to Sea Island and resumed service with 121 C & R Flight. On 18th June '62 it is recorded in the Unit's diary working with Albatross 9302 searching for an overdue boat. On 29th September '62 it was involved in the rescue of a N2447C which had landed out of fuel near Saturna Island. This, however, was its last mission as the following month, October 1962, Otter operations by 121 Communications & Rescue Flight came to an end, and both 3680 and 3686, then the Flight's other Otter, were flown to the Canadian Pacific depot at Lincoln Park, Calgary and placed into storage as reserve aircraft. 3680 remained there until 12th March 1964 when it was ferried to Saskatoon and put into storage there pending disposal. Its period of storage at Saskatoon however was brief as in October '64 it was allocated to the RCMP Air Division, Ottawa and took up marks CF-MPK, one of eight Otters to serve with the 'Mounties'. From 1964 until 1972 the Otter was based at Whitehorse, Yukon Territory. In 1972 the Otter was sold to EB Exploration of Ottawa for survey work, with an option to re-purchase. It was registered to its new owners as CF-EBX. It was in fact bought back by the RCMP in 1974, but they retained the 'fixed' registration of CF-EBX as their own special CF-MP- series of registrations was nearly used up. Back with the RCMP the Otter was based at Thompson, Manitoba from 1974 until 1978 and then moved to Goose Bay, Labrador. It was damaged in an incident at Goose Bay on 25th May 1981. The Otter had four passengers and their baggage on board and was 500 pounds below maximum take-off weight. After holding for a Boeing 737 and a DC-3 to depart, the pilot started his take-off run. Shortly after lift-off, he reduced to climb power and started a right turn. The airspeed began to decrease so he lowered the nose and applied full power but the Otter continued to settle. The pilot attempted to turn back to a cleared area beside the runway but the aircraft struck trees, touched down, then bounced once before coming to rest. Investigation revealed no airframe or engine deficiency and concluded that the turn was initiated prematurely, resulting in a stall at too low an altitude for recovery. The pilot stated that he turned early to avoid wake turbulence, although he did not feel that wake turbulence was a factor in the accident. The main area of damage was around the tailwheel and after a delay of a few months sourcing parts, C-FEBX was flying again in November 1981. The Otter remained based at Goose Bay and was involved in another incident on 11th April 1985 at Mary's Harbour, Labrador. The pilot was attempting a take-off in a ten knot 60 degree left crosswind. As the tail lifted off the ground, the Otter veered sharply to the left. The pilot applied brake and opposite rudder to regain directional control but was unsuccessful. He then closed the throttle in an attempt to prevent the aircraft from leaving the runway. However, the Otter rode up into a snowbank at the edge of the runway, damaging the right wing and stabiliser. The damage was repaired, but the Otter did not serve with the RCMP for much longer. It was removed from service in September 1985 and handed over to the Crown Assets Disposal Corporation for sale. At this stage of its career it had 13,498 hours on the airframe. The Otter was sold to a Vincent Courville of Montreal and registered to him. 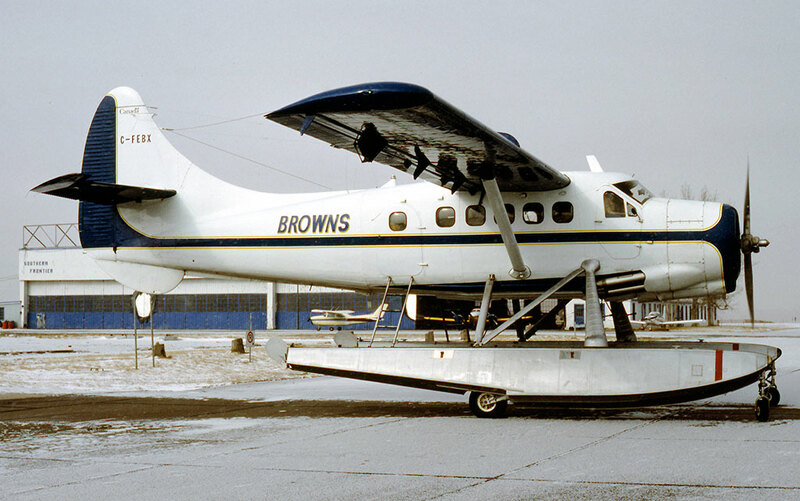 The registration was cancelled in December 1985, when the Otter was registered to McMurray Flight Centre Ltd., of Fort McMurray, Alberta, trading as Brown's Air Service. This registration was cancelled in June 1986 and the Otter registered to Queen Charlotte helicopters Ltd of Sandspit on the Queen Charlotte Islands. C-FEBX was noted at Vancouver in October 1987 carrying Queen Charlotte Helicopters titles. The registration to this company was cancelled in January 1988 and EBX registered to I&J Logging Ltd., of Campbell River, BC. The registration to this company was cancelled on 24th February 1988. 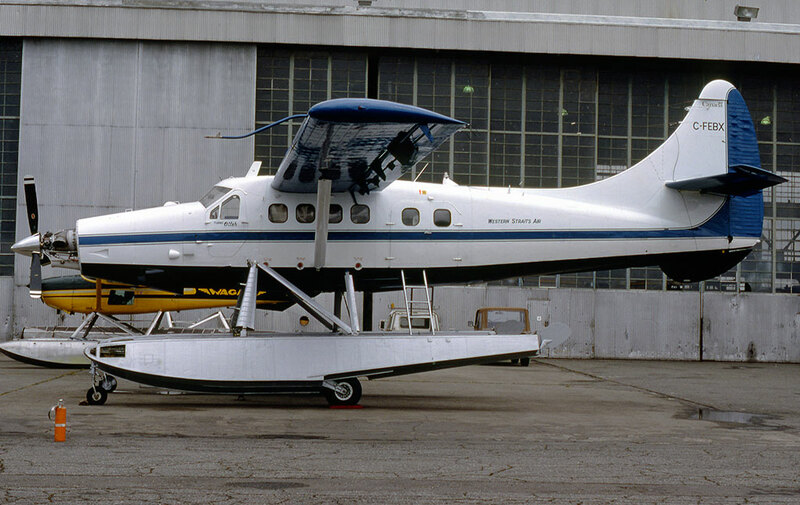 The Otter flew for Harbour Air Ltd., of Vancouver during March/April 1988, back on the river adjoining the Vancouver International Airport, the site of the Sea Island Air Station, where it had been based with the RCAF. 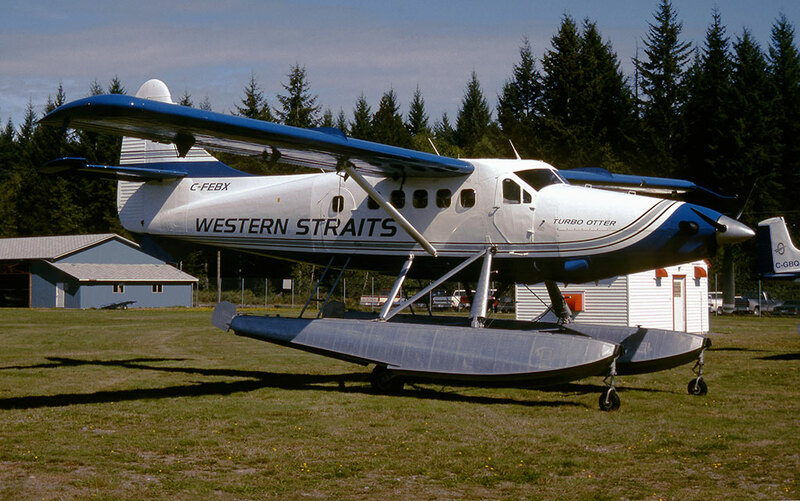 The Otter was then acquired by Gynn Bay Logging Ltd., trading as Western Straits Air, of Campbell River, BC who arranged for it to be converted to a Vazar turbine Otter at the Aeroflite facility at the Vancouver International Airport. 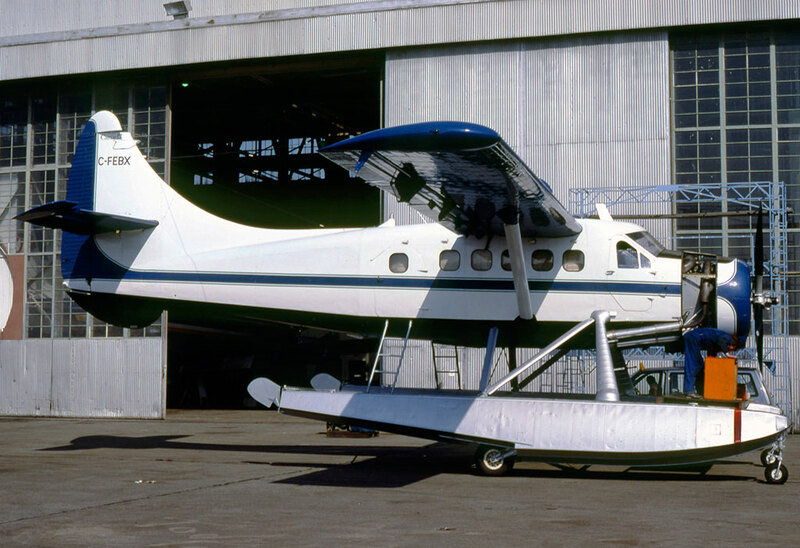 As a DHC-3T it joined the Western Straits Air fleet operated on amphibious floats from the airport at Campbell River on Vancouver Island. This company had originally flown piston Otter CF-XUY (142) which was replaced by EBX as a turbine, which was joined by C-FSVP (28) also a turbine, in January 1995. It offered a general charter service and was also much used to move logging crews to and from camps along the BC coast, the company's owners also owning a logging business. With the advent of deregulation, corporate flight departments could charter their aircraft to earn additional revenue. 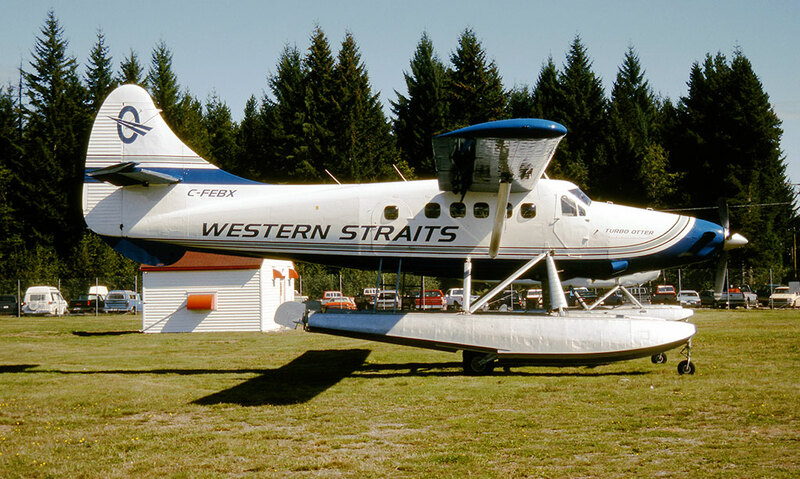 C-FEBX was to serve with Western Straits Air for six years. 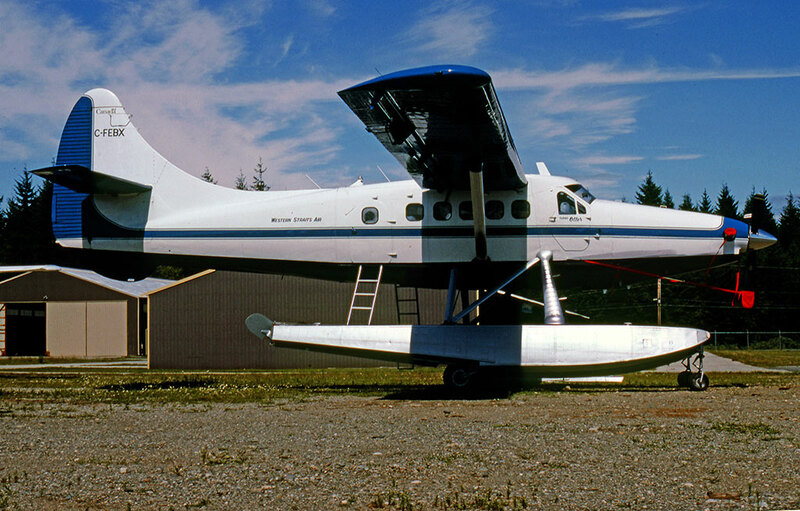 A typical day's work was 10th April 1992 when EBX flew from the Campbell River Airport to a rough gravel strip on the side of a mountain at Moh Bay, 35 nautical miles away, as did company Islander C-GYMW. “Sitting in the cockpit of EBX, it was hard to believe that this was an Otter. When the pilot started up, there was no coughing, banging and smoking as with any 'self-respecting' Otter. Instead came the well mannered swoosh of a PT-6. Being light EBX took off in moments, climbed quickly and cruised the 20 minutes to Moh Bay at 130 KIAS, 25 to 30 knots faster than a 'steam-powered' Otter. Awaiting the two planes was a crowd of burly loggers and their hefty kit. The loggers crammed aboard EBX, a few others squeezed into 'YMW and the aircraft returned to Campbell River. The logs were written up for the day and showed 14,849.8 flying hours for EBX”. The Otter was involved in a minor incident at the Head of Knight Inlet, BC on 28th October 1993. On the landing roll, the left main gear on the amphibious floats collapsed and the aircraft skidded off the runway. The left float was damaged but there were no injuries. A securing bolt in the left main gear had failed. The damage was repaired and the aircraft returned to service. Sadly, EBX came to grief six miles north-west of its base at Campbell River on 27th September 1995. The owners of Western Straits Air controlled a construction company whose loggers were working at Triumph Bay, forty nautical miles south of Kitimat, BC. EBX was dispatched to Triumph Bay to collect the logging team and return them to Campbell River. At that stage, as well as turbine Otters EBX and SVP, the company also operated a Cessna 206, a Beaver, an Islander and a KingAir 200, which was used for scheduled passenger services between Campbell River and Vancouver. Otter EBX took off from Triumph Bay at 16:34 hours Pacific Daylight Time with one pilot and nine passengers on board for its VFR flight to the Campbell River Airport. At 19:01 hours the pilot called Campbell River FSS and reported that he was seven nautical miles northwest of the airport inbound for a landing. The pilot was given the Campbell River weather observation for 19:00 hours, which was ceiling 300 feet overcast and visibility two miles in light rain and fog. He requested a special VFR clearance to enter the control zone, which was granted at 19:04. Radar data indicated that, at that time, the aircraft was about one mile northwest of Tyee Spit, a frequently used alternate site (water) for company aircraft when weather conditions precluded a landing at the Campbell River airport. After passing Tyee Spit, the Otter turned southbound and flew directly toward the airport. At about two and a half miles from the airport, the aircraft turned right to a heading of approximately 310 magnetic and flew in that general direction for about two minutes. The aircraft was on a track that was approximately parallel to the extended runway centre-line, tracking outbound from the airport, with the localizer and the Campbell River NDB to the left. The Otter passed abeam the NDB, which serves as the final approach fix for the ILS approach to runway 11 and continued outbound. At 1909 hours, at about three miles outside the beacon, the Otter turned left to a southerly heading towards the NDB and at 19:10:08 the pilot radioed that he was seven miles northwest, this being the last transmission from the flight. At 19:10:25 radar contact was lost when the Otter crashed in heavy fog into the densely wooded side of a 1,047 foot hill at about the 860 foot level, in straight and level flight. The pilot and seven passengers were killed in the crash and the two remaining passengers received serious injuries. At the time of the crash, EBX had 16,428 hours on the airframe. It had crashed on the same hill as Pacific Western Convair 640 CF-PWR had fatally crashed on 17th September 1969. When the Otter failed to arrive at Campbell River airport, the FSS operator immediately informed the company and within ten minutes of the accident an emergency response had been initiated. A Search-and-Rescue (SAR) DHC-5 Buffalo from 442 (Rescue) Squadron at nearby CFB Comox on a training flight in the area was informed of the overdue aircraft and had already picked up an ELT signal. Weather conditions precluded a visual aerial search. About one hour after the crash, a CH-113A SAR Labrador helicopter from 442 Squadron took off from CFB Comox. Low ceilings and fog forced the helicopter to land at the Campbell River hospital, where one SAR technician from the helicopter joined local police for a land search. The air search resumed at 23:10 hours and a steady ELT signal was picked up at 2320. Using flood lights, searchers located the aircraft in a wooded area and at 23:55 hours the site was reached by the ground search team. One survivor (a lady, the camp cook at the logging camp) was found wandering outside the aircraft and was evacuated by ambulance. The second survivor was extricated from the wreckage and flown to hospital by the SAR helicopter. Western Straits Air did not survive for too long after this horrific accident. Most of the aircraft were disposed of, including the other turbine Otter C-FSVP, which was sold in December 1995. The following year, the remains of the operation were taken over by CoVal Air.